Zlatni Zalaz consists of newly renovated apartments on the beautiful island of Rab in Croatia. If you are searching for a beautiful and quiet place with great atmosphere, Zlatni Zalaz apartments are the right place for your vacation. Dine in our restaurant, taste local specialties and experience the unforgettable atmosphere of watching the most beautiful sunset on the entire island. 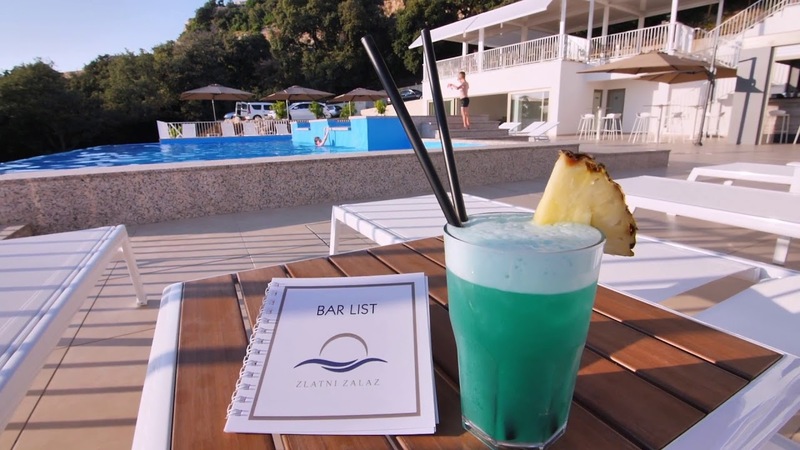 The apartments are fully air-conditioned and offer an on-site restaurant with outdoor terrace, an outdoor pool with a relaxation area and a bar. For active relaxation, there is a gym and many tourist routes in the surroundings. The apartments are suitable for families with children as well as for couples. The beach is a few meters from the apartments. Rab is one of the most beautiful islands in the Adriatic Sea. In addition to the historical town of Rab, the following are also integral parts: Barbat, Banjol, Palit, Kampor, Mundanije, Supetarska Draga and Lopar. In the northeast, the Lopar Peninsula comprises a significant part of the island, bordered by Lopar Bay on one side, and Crnika Bay on the other. The entire peninsula is extraordinarily rugged, with famous beaches, including one of the most popular beaches of the Adriatic, the sandy beach of Rajska (Rajska Beach). Kamenjak (sometimes also Straža, 588 meters above sea level) is the highest mountain on the island. At the peak you will reach the concrete road from the settlement of Mundanija. From the top you will have an unforgettable view of the entire island.